Cowboy Up was a very nice cabin. I do have a few recommendations. There needs to be more seating in the living areas. Also we had to go buy pot holders, towels and wash cloths for the kitchen. The pots and pans could use an upgrade. The hot tub wouldn’t come on when we first got there so we called maintenance, he was there within an hour and had it fixed. The staff we dealt with were very friendly. The stairs are tiresome but doable. I would recommend this cabin it is very close to town. The cabin was nice, not enough sitting space in the dining area for 5 bedrooms of people. The furniture in the game room is really torn up, couldn't sit on it. The tv in dinning area should be on the wall for better viewing.other than that we enjoyed the cabin. This was a family trip of 3 generations. The five bedrooms and two pull out worked well us. I gave a 9 on location b/c looking at the pic I was hoping to be tucked away back in the woods. We has a few other cabins around us, but there was no noise issues. The cabins are well soundproof. The community pool was nice and not overcrowded while we was there. I gave a 9 on cleanliness b/c the group before us left a mess and the housekeeping ladies did worked hard to get it clean by 4. They missed a few little things, but we had a broom and dust pan. Over all the cabin was nice and my bed was very comfortable to me.. There was a w/d there to wash clothes and we did that before we left. This saves time when you get home( just unpack and put clothes away). I have recommended the cabin and will use them again myself. We stayed at Cowboy up July 9-13,2018. The Express check in was great! It was very convenient to all the restaurants and attractions. We had 10 adults and 5 kids, 2 of those were infants. Everyone was comfortable in their own room! The internet didn’t work when we got there, the hot tub wasn’t working and we needed more chairs at the kitchen table. Alex from maintenance was very helpful and fixed all of that for us right away! The kitchen could use more mixing bowls and baking dishes. No large skillet either. My only real complaint is that the floors were swept but filthy! Out feet turned black from walking on them just for a few mins!! Other than that, I would recommend this cabin! We all had a great vacation!! My family had a good time, cabin usa are awesome. Our cabin was plenty of room, location was great just few minutes from the strip. Would like to do it again in the future. I originally booked Bearly Rustic while traveling from Fl to Tn. After stopping in SC for rest, I decided to check my email (10:30pm). I received an EMAIL (no phone call) from Destany stating the cabin I booked, they were in the process of blocking when I booked it so they had moved us to another cabin. (Probably would have settled better had I known the reason why bc I originally thought someone else was getting the cabin I had already paid for). My family, of 8 (4 adults and 4 children) were all extremely disappointed, as was I. The cabin we were moved to looked nothing like the one I booked, didn’t have a pool (a big reason for choosing the one we did), etc. I emailed Destany back as soon as I got the email and told her “Lazy Days lodge” wasn’t going to work for us but that I would do more research and find one similar. I found Cowboy Up and Moonshine Manor which both were similar (the look, the bed/rooms, and pool). She replied and told me that they could put us in one of those cabins but that I would have to pay the difference in cost. (Our family had already discussed prices etc and we could afford Bearly Rustic and that’s what our budget was - nothing more). I explained my aggravation and how I didn’t feel it was fair that WE should have to pay for someone else’s mistake. I never received another email from her (this was about 11pm now) so I had a sleepless night not knowing where my family would be laying their heads the next 4 days as we were on our way to tennessee. The next morning, I called Cabins USA 5-6 times and left messages each time and continued to call until I got ahold of someone. Cindy finally answered and was a blessing to deal with! She not only shared concern but felt my aggravation and agreed that we shouldn’t have to pay more (I forgot to mention the cabins I chose to replace the one I originally booked were $92 more). Cindy apologized and told me she would speak to her manager as soon as she came in and would give me a call ASAP. Approximately 45 to an hour later, I received a call. It was Destany. Destany told me she was Cindy’s manager and had actually been listening to our conversation as she ate her breakfast. Not sure how true this is or why she wouldn’t have stepped in at that time, but she told me they were going to go ahead and waive the extra fees and book up for Cowboy Up. We traveled the next few hours and finally made it to check in - check in was a breeze. Drove to the cabin, it was absolutely gorgeous and everything we expected. We couldn’t connect to WiFi so we called for assistance and Alex Hall responded out. He was very friendly and helpful and even passed our interrogation process (we wanted to know things to do etc). I voiced my problems to him with our booking experience and he told us that he would inform a supervisor and that they may contact us. The next day while at the resort pool (beautiful view, hot, we were the only ones there) I received a call from LaDonna (I believe was her name). She apologized numerous times and explained how emailing someone was not protocol and that we should have been called and notified immoderately about the cabin situation. She (as well as Alex the night before) told us what was going on with Bearly Rustic, which kind of made me feel a little better. In turn she offered a free night to come back which we decided to not do at that time bc we didn’t know when we would return (but we absolutely will come back) so she refunded us some money. All in all, it was an awesome place and experience. The cabin had a room for everyone so we could separate and have alone time. The washer and dryer were a blessing in disguise and one of the best amenities. We did have only 2 forks and 13 knives but we went to Walmart and purchased plastic ones. We were very close to Pigeon forge and Gatlinburg which we visited multiple times while there. Walmart was 3 miles away. Beds wer comfortable, bathrooms were big in size. My family had an amazing vacation with unforgettable memories and the staff did an amazing job making up for their boo boo. My overall rating would be a 10 out of 10. I would absolutely recommend this place to anyone! We had a great time in this cabin. It was comfterble and spacious and clean. The cabin was very nice! The phone connection with departments was terrible. The general manager was very nice in getting our problems taken care of! And yes we would probably stay again! This cabin had plenty of room. The beds were comfy! We were told that there was parking for four vehicles. That statement is stretching it! We had 4 small crossover SUVs and had to squeeze the 4th one in front of the other 3! The hot tub didn't have water in it. We called about it and was told someone would come do that. Then we were told it was broken. I feel like this issue was probably known before we checked in, if it was adequately checked after the previous guests. 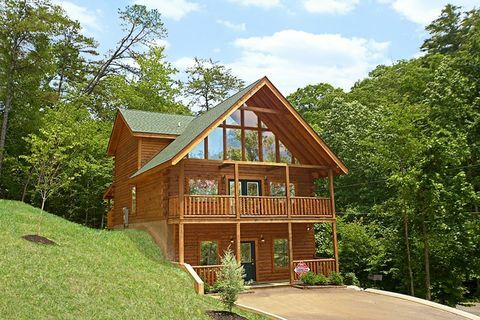 This cabin is an easy drive into Gatlinburg. Adequate pots, pans, and dishes. Electric fireplace is mostly for looks. The family area on the middle floor can get pretty chilly because of all the windows, but I love all the natural light. The furniture in this room is kinda worn too.The boys loved the pool table. The picture on here looks like it has a bit of a yard, but it doesn't. The trees are grown up a good bit. Be aware that you basically share a driveway with several other houses. If you are looking for privacy, this isn't the place. Be aware that the kitchen is upstairs​ so all of your groceries, coolers, and such has to be carried up there. Not an issue for us with a few strong teenage boys! All in all it was a good experience and a nice house. We would consider staying here again and renting with Cabins USA. The only thing with Cowboy Up was the sofa and oversized chair needs replaced . The island bar top looks rough... The cabin over all very nice and comfortable. We would stay there again. THE HOUSE WAS VERY ACCOMMODATING TO OUR GROUP. WE HAD AGES 4 TO 65 AND HAD ENOUGH SPACE FOR PRIVACY AND GETTING TOGETHER. WAS DISAPPOINTED IN THE SEATING FOR THE KITCHEN AS WE ALL COULD NOT EAT TOGETHER. ALSO THE WASHER DID NOT WORK CORRECTLY AND WE REPORTED IT AND IT WASN'T FIXED WHILE WE WERE THERE. AS , DUE TO TRAVELING SPACE, WE TOOK LIMITED CLOTHING KNOWING WASHER AND DRYER WERE TO BE AVAILABLE , IT WAS VERY INCONVENIENT AS WE HAD TO PURCHASE ADDITIONAL CLOTHING WHICH WAS AN EXPENSE WE HADN'T PLANNED. HOPEFULLY THE PROBLEM IS RECTIFIED FOR THE NEXT RENTER . OVERALL , WE LOVED THE HOUSE. Thank you for taking the time to let us know about your recent stay in Cowboy Up! We here at Cabins USA strive to give each of our guests the best stay possible while vacationing in the Smokies. I apologize that you did not have use of the washer and dryer during your stay. Maintenance is working on correcting this issue. When you are ready to stay with us again, please mention you are a return guest for an additional discount. Thank you again for your review and thank you for choosing Cabins USA! Trash wasn't picking up when I called raccoons got to it. Are only two complaints with the cabin where that the propane was out for the grill and the dishwasher wasn't working. My stay at cabins USA was AWESOME. We had a smooth check-in and the cabin was just like the website. We had one. issues... we had a leak in the upstairs shower that impacted one of the bedrooms downstairs, water was leaking down on the bed at bedtime, called the emergency number and the maintenance guy was so uninterested and did not come out to assist the issue. The couches in the cabin is such and ugly I sore they need to be replaced. The couch covers on them were to big and made whole room not look appealing. Their old and outdated and really need replacing. Other than that we enjoyed the stay will definitely book again and recommend to friends and family. Cowboy up is my home away from home. See you In july. Thank you for taking the time to let us know about your recent stay in Cowboy Up! We here at Cabins USA work hard to make sure each of our guests have the best stay possible while vacationing in the Smokies. I apologize for the issues you experienced when interacting with our maintenance worker. Your comments have been forwarded to our maintenance supervisor and this will be addressed. Your comments regarding the couches have also been forwarded to our Owner Liaisons who will be bringing this to the owner's attention. When you are ready to stay with us again, please mention you are a return guest for an additional discount. Thank you again for your review and we look forward to seeing you in July! Had 4 couples stay and we had the best time!!! The only issue was some of the main floor furniture needs to be replaced. Other then that the cabin was amazing! Close to Pigeon Forge and didn't take long to get to Gatlinburg!! Would stay again!!!! Thank you for taking the time to let us know about your recent stay in Cowboy Up! We here at Cabins USA work hard to make sure each of our guests have the same great stay you enjoyed while vacationing in the Smokies. Thank you for letting us know about the main floor furniture. Your comments have been forwarded to our Owner Liaisons and they will be bringing this to the owner's attention. When you are ready to stay with us again, please mention you are a return guest for an additional discount. Thank you again for your review and thank you for choosing Cabins USA! Overall a great stay. We reserved this cabin and the one across the street that is identical. Our group had a great time and particularly enjoyed the ease of access and close proximity to the main parkway in Pigeon Forge. I am so happy to hear that you enjoyed your stay in Cowboy Up! We here at Cabins USA work hard to make sure each of our guests have the best stay possible while vacationing in the Smokies. When you are ready to stay with us again, please mention you are a return guest for an additional discount. Thank you for choosing Cabins USA and we look forward to having you as our guest again! This was my second time booking through Cabins USA. This time we stayed in a lager cabin with 4 couples. It was wonderful. Everything was beautiful in the cabin. We had a small problem with out TV'S but some was sent a out to fix them right away. I love Cabins USA and I will definitely be booking again. I am so happy to hear that you enjoyed your stay in Cowboy Up! We here at Cabins USA work hard to make sure each of our guests have the same great stay you have come to expect and enjoy when visiting the Smokies. Thank you again for your review and thank you for choosing Cabins USA! My family and I had a wonderful time staying in Pigeon Forge at Cowboy Up. The cabin is close to most attractions. Bigger TVs and updated furniture would be nice for this cabin. We look forward to booking again with Cabins USA. I am so happy to hear that everyone enjoyed their stay in Cowboy Up! We here at Cabins USA work hard to make sure each of our guests have the same great stay you enjoyed while vacationing in the Smokies. Thank you for your suggestions. Your comments have been forwarded to our Owner Liaisons and they will be bringing that to the owner's attention. When you are ready to stay with us again, please mention you are a return guest for an additional discount. Thank you for choosing Cabins USA and we look forward to having you as our guest again! A group of 5 couples stayed and everyone had their own space and privacy! The cabin was beautiful and very clean. We will book this cabin again in the future! The new flooring was really nice. It is much cleaner than carpet. We had problems with the main TV and front door but had quick service that got them fixed. However; we did not have enough towels, wash clothes and hand towels for a 3 night stay. The couches in the living room need to be replaced. They are absolutely worn out. Also, the sun came through the uncovered living room windows and there was no where to get to not have the terrible glare. The kitchen table and chairs were totally in the sun. That part was really bad. Maybe a tinting material on the top windows and blinds on the ones that can be reached. We had a wonderful stay in Cowboy up! The location is great! We had 5 cars so we did have an issue with the parking but we made it work. The outside of the cabin could use some upkeep and the couches definitely need to be replaced as they are worn out. Overall a great stay with no major issues! Thank you for taking the time to let us know about your recent stay in Cowboy Up! We here at Cabins USA work hard to make sure each of our guests have the same great stay you enjoyed while vacationing in the Smokies. Thank you for letting us know about the couches in the cabin. Your comments have been forwarded to our Owner Liaisons to be addressed. When you are ready to stay with us again, please mention you are a return guest for an additional discount. Thank you again for your review and thank you for choosing Cabins USA! Furniture in seating area should have been replaced before it was rented. For a cabin that sleeps 15, there should have been more seating available. We had to call twice for the air conditioner to be repaired. We also had to call on Saturday morning before leaving for a water leak on the third floor that was leaking from the ceiling in main floor bathroom. I liked the way the cabin was built with the 5 bedrooms and 5 bathrooms which had plenty of room for guest. Also the fact that there was a king size bed in each room. However I was disappointed with the cleanliness of the cabin and some of the furniture needs to be replaced. My family and I were amazed at the beauty of the Cowboy Up Cabin we rented for our family reunion. We had a wonderful time. The only thing we saw negative, was that it's time for the owner to update the sofas. The arms and cushions of the sofas were worn and peeling. Also, the kitchen seating for the amount of people we had was too small. My nephew's kitchen table in his cabin was longer. But overall, we enjoyed the experience and I'm already giving out your information to other people to look into booking a cabin from you. Your overall rating is a 10. Thank you for taking the time to let us know about your recent stay in Cowboy Up! We here at Cabins USA work hard to make sure each of our guests have the best stay possible while vacationing in the Smokies. Thank you for letting us know about the sofas in the cabin. Your comments have been forwarded to our Owner Liaisons who will bring this to the attention of the owner. When you are ready to stay with you again, please mention you are a return guest for an additional discount. Thank you again for your review and thank you for choosing Cabins USA! Cowboy Up should've been called Cowgirl Up because us ladies had an amazing time there. We had everything we needed, plus more. Alot of space 4 the kids 2 runaround! I'm sure those stairs are happy now. ☺ The hot tub was amazing! The location was just in the right place. Not 2 close & not 2 far. I'll recommend this cabin in the near future! Thanks 4 everything! U guys rock! We enjoyed our stay at Cowboy up but the cabin could use: more lighting in the kitchen cooking area and a working ice maker. Thank you for taking the time to let us know about your recent stay in Cowboy Up! We here at Cabins USA work hard to make sure each of our guests have the best stay possible while vacationing in the Smokies. Thank you for letting us know about the lighting and icemaker. Your comments have been forwarded to our maintenance department to be resolved. When you are ready to stay with us again, please mention you are a return guest for an additional discount. Thank you for choosing Cabins USA and we look forward to having you as our guest again! Great cabin with plenty of room for 12 of us drawbacks were the parking lot is too small and could only fit 3 of our 4 vehicles. Also table only sat 6,bar another 4 so well couldn't all sit down together for dinner. Thank you for taking the time to let us know about your recent stay in Cowboy Up. Your comments about the seating at the table have been forwarded to our Owner Liaisons who will bring those to the owner's attention. Thank you for choosing Cabins USA and we look forward to having you as our guest again! Needs over all cleaning, windows, fans, etc., windows need coverings, could see straight thru cabin across the street. Kitchen not equipped for cooking, table does not accommodate 10 people. Cabin needs to be updated, bedrooms and bathrooms were great, the other furniture needs to be updated. Thank you for taking the to let us know about your recent stay in Cowboy Up! We here at Cabins USA work hard to make sure each of our guests have the same great stay you enjoyed while vacationing in the Smokies. When you are ready to stay with us again, please mention you are a return guest for an additional discount. Thank you for choosing Cabins USA and we look forward to having you as our guest again! I am so happy to hear that you enjoyed your stay in Cowboy Up! We here at Cabins USA work hard to make sure that each of our guests have the same great stay you enjoyed while vacationing in the Smokies. Thank you for letting us know about the cabin's carpet. That has been forwarded to our maintenance department so it can be corrected. Thank you again for choosing Cabins USA and we look forward to having you as our guest again! It needs blinds in the living room and more parking. Great location and plenty of space. Thank you for taking the time to let us know about your recent stay in Cowboy Up. We here at Cabins USA work hard to make sure that each of our guests have a memorable stay while visiting the Smokies. Thank you for letting us know about the blinds in the living room. That has been forwarded to our maintenance department so they can take care of that situation. Thank you again for your review and thank you for choosing Cabins USA! I had a hard time checking in. I paid a deposit by credit card and was told they would have to see the card, which I left at home because I have a tendency to use it if I have it with me. When I told them it was still a good card, I was told I put it under another name which was on the deposit. I had to wait till someone else came to help and the clerk took others while I waited. The other clerk came and saw where it was a staff members name on the deposit that took the card. That was very disgusting, because I would never use someone else's name. But that worried me because I thought someone else's name was being used with my card! My husband came to see what was taking so long and I told him. They could not find the faxed form for the the tax exempt and thank goodness, I had a copy that I could give them. The clerk apparantly had looked in the wrong place to find it. What should have been only 5 minutes, took me about an hour. Quick and easy to make reservations. Cabin was cleaned and very nice. Very comfortable beds and furniture. Check out was rather easy. I would recommend to anyone that's looking for a cabin to use cabin USA. The cabin is very spacious if you have a large group and the bedrooms are divided, which is nice. The wifi is HORRIBLE! The only door to the hot tub is through the bedroom on the middle floor, but that was ok. There aren't a lot of pans to cook with, so a big breakfast is out. The location is great! Overall the cabin was veyoung nice. The leather furniture has about had it though. Needs more parking spaces. Cowboy Up was an great place to stay, it was very well kept, really nice furniture. I would definitely recommend it. And the staff at Cabins USA were really nice and helpful. We definitely want to stay here again. Thank you! Thank you for your review. We are delighted that you enjoyed your stay with us. We apologize for any inconvenience that you may have experienced. We appreciate your feedback on your stay and will have our maintenance department install blinds that are needed at the cabin. We hope that we will see you again soon. Do not forget to call and ask about our return guest discount. The carpet in this cabin was worn and needed cleaning. We did not have enough bath towels and wash cloths. We each had only one washcloth for a 4 day, 3 night stay. Otherwise, everything was great. We had to call about a tv repair and it was taken care of in a short time. The cabin was very roomy and great for larger groups...location was great and the cabin itself was great. Could use a good cleaning. The carpet was dirty and there were some spider webs. I know there is a cleaning fee as part of the rental fee...so you might want to use it toward cleaning the carpet.... it's the little details that really made a place. Overall...I would rent again...but will ask if the carpet has been cleaned. The cabin was immaculately clean. This cabin is so wonderful. I would advise anyone looking for a cabin of this size to rent this unit. It is beautiful. It's location is wonderful. It doesn't have a great view of the Smokies but you get so lost in this cabin you forget all about that. We had a very enjoyable stay. There was a problem with the hot tub(air lock). The service person(Brandon) was very professional. The second floor has open windows with no blinds. That room is facing the West, with direct sunlight. It would be nice if there were curtains or blinds. It might be helpful to have a door bell on the entrance level. When the service person arrived, we were on the second level and didn't hear him when he knocked. He did call prior to the visit, but my phone was charging. Everyone had a very good time. Thank you for your review. We appreciate your stay with us at Cowboy Up. We are glad that you had a good stay with us. We are glad that maintenance was able to address your issues quickly and professionally. We hope that we will hear from you again in the future. The only things we were disappointed with was the Wi-Fi. The Wi-Fi was shared with a cabin in front of us and half the time it didn't work cause the signal was very weak. And the pool was a little bit of a walk...But all in all we had a nice stay.. Very relaxing.. Thank you for your review Bobbie. We appreciate your feedback. We apologize if you were inconvenienced during your stay. We hope that we will hear from you again soon. Do not forget about our return guest discount. We usually stay with Cabins USA. We have never had an issue. This cabin has a broken table downstairs. The dining chairs are a little wobbly. These things never affected our time there though. We loved having a TV in each bedroom. The last time we stayed in this cabin we didn't think that it had a TV in each bedroom. I think most anyone would enjoy staying here. Thank you for choosing Cabins USA. We thank you for your business, and are glad that you enjoy your stays with us. We apologize you encountered an inconvenience during this stay. We will have both issues addressed. We look forward to seeing you again soon. The cabin was very nice for our large group. It was great to have a private bathroom for each of the bedrooms. Parking accomodated 2 vehicles nicely, which made it challenging to park the other vehicles. The view was somewhat deceiving on the website as neighbors were immediately next door and the wooded view was sparse.A few items were broken upon our arrival. Maintenance quickly assisted us with one item and the others were to be repaired after our departure. Our family plans to meet again in January 2015 and will consider Canins USA properties. I am extremely happy with the service that I recieved during my stay. The cabin was AWESOME! The carpets were very clean (nearly new). The bathrooms were very clean, the beds and linens were extremely clean as well. I am also very happy with the selection of kitchen items that were available for us to use since we were cooking during our stay. There were plenty of plates, cups, silverware, pots, pans, etc. We had an issue with the refrigerator where it was leaking water, and the maintenance employees were out there the same day to fix the issue!! Awesome service. I took comfort in the fact that we could call the leasing office with any issue and they were very friendly and willing to help. The location of the cabin was great as well! It was not far off the parkway and was located right up the street from the resort swimming pool. My family and I really enjoyed ourselves and we look forward to returning for another stay with Cabins USA! No wifi and no assistance with correcting the issue. I have seen previous reviews about the wifi but thought it would have been corrected but it had not. Addvertisted Wireless internet access, my wife hoping to stay caught up on school work but was unable to. Also the Refrigerator broke down during our stay. Internet warning. This cabin utilizes wireless from another nearby cabin and signal was pretty much non-existant. If we sat near the front windows, we got intermitent signal. No other internet capabilities, so if internet is necessary, forget this cabin. TV's were much better than the pictures. All flat screens. Only major complaint was related to mice in the upstairs ceiling. We left one day early because of it but will admit we didn't call in our complaint since we weren't sure anything could be done about it during the length of our stay. Loved the 5 King bed rooms and bathrooms. The cabin had a great location and there was plenty of room for everyone! It was a wonderful place to spend the holiday, we can't wait until next year! Do not let someone who is very cold nature sleep on the bottom floor. No way to control heating on that floor. Everything else was great. We loved this cabin and this trip was much better than the one we did in april for spring break. The people were nice and friendly. Totally different atmosphere from the Cabin USA in gatlinburg..... I have plans on returning with more people next time and renting more than one cabin. YOU GUYS ROCK!!!!!! My family and I enjoyed our stay at Cowboy up. Cowboy Up is a nice spacious cabin to fit your family needs. On a rating scale of 1-5 I would give this cabin a 4.5 due to the kitchen being on the second level of cabin. Other than the issue we had with the kitchen being on the second floor we really enjoyed our stay. The staff at Cabins USA is highly recommended we have stayed at 4 other cabins through them and never had an issue. We are already planninig our stay next year and will be using Cabins USA for our accomodations. The cabin is located in a convenient part of Pigeon Forge and is well laid out and spacious. Amenities, decorations, fixtures and quality of the cabin are only slightly above average. Carpet is worn, TV's are small, outdated and nearly spent, and the electrical grid needs attention/work. If the guest uses electricity on the wrong circuit, they will find themselves without power as the breaker will trip. Most annoying is that the door locking mechanism is unpredictable. We arrived in the evening when it was cold and we could not enter because of a malfunction of the door lock and had to wait nearly an hour before someone arrived from Cabins USA to let us in. Overall, our experience with this cabin was satisfactory, but slightly frustrating during our stay.